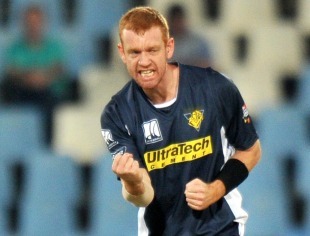 Andrew McDonald claimed 5 for 38, his first five-wicket haul in one-day cricket, as he helped Victoria to a 12-run win over Queensland and moved them to third place in the table. Defending 237, McDonald had Peter Forrest caught behind for 27 to reduce Queensland to 4 for 61 before James Hopes' 39 formed a 79-run partnership with Nathan Reardon. Hopes fell to Clint McKay, whose 10 overs conceded 29, and Reardon was then run out by David Hussey for 53. Again, though, Queensland fought back as Steve Paulsen (36) and Michael Neser (22) added fifty to bring the requirement down to 37 from 33 balls when McDonald removed both batsmen in three deliveries. Cameron Gannon hit four boundaries in his 22 to keep Queensland's chances alive, but fell to McDonald at the start of the penultimate over. Aaron Finch had led the way for Victoria with 71 from 106 balls but he received little support as Victoria slipped to 6 for 145. However, they were revived by Glenn Maxwell, who struck a 37-ball 50, and Robert Quiney (38) in a stand of 67 for the seventh wicket before Alister McDermott wrapped up the innings to finish with 4 for 30.